Glenn Anderson played 16 seasons in the National Hockey League (NHL) for the Edmonton Oilers, New York Rangers, St. Louis Blues and Toronto Maple Leafs. Anderson was known to have a knack for stepping up in big games, which garnered him the reputation of a "money" player. His five playoff overtime goals ranks third in NHL history, while his 17 playoff game-winning goals puts him fifth all-time. Anderson is also first all-time in regular season game winning goals in Oilers history with 72. During his NHL career, he was part of six Stanley Cup winning teams, five with the Oilers, and one with the Rangers and he was a participant in four All-Star Games. He is one of only seven Oilers to have won all five Cups in franchise history. Anderson was inducted into the Hockey Hall of Fame on November 10, 2008 and his jersey number, 9, was retired by the Oilers on January 18, 2009. 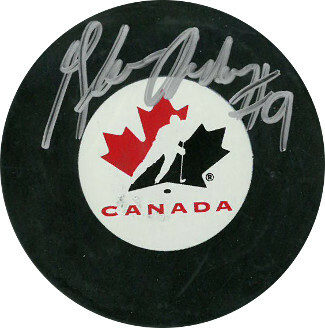 Glenn Anderson has hand signed this Team Canada Hockey Puck. MAB Hologram and Certificate of Authenticity from Athlon Sports.